Nearly two years after the release of Unhinged, the book continues to prompt conversation among readers and reviewers. The July 14, 2011 issue of The New York Review of Books includes the second of a two-part review of several new books on the topic of psychiatry, including Unhinged. 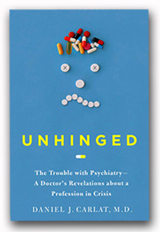 Review author Marcia Angel, Senior Lecturer in Social Medicine at Harvard Medical School and former Editor in Chief of The New England Journal of Medicine, calls Unhinged “absorbing” in her article “The Illusions of Psychiatry,” where she also explores Irving Kirsch’s The Emperor’s New Drugs, Robert Whitaker’s Anatomy of an Epidemic, and the DSM-5. For now we will most likely hobble along within a market-based model with fragmentation of care for both those in the public health system with major mental illness and those like Dr. Carlat’s patients who are less ill, have decent health insurance and can afford drug treatment and psychotherapy. Those who see doctors like him will be fortunate, receiving trustworthy guidance in a system where trust has become a precious commodity. Unhinged is now available for purchase! I’ve been making the rounds on local and national radio programs, discussing the book and the state of psychiatry. Visit our News page for links to many of my interviews. You can buy Unhinged at most bookstores as well as any of the online retailers listed on this page.